The Oklahoma Association of Conservation Districts hosts annual speech, essay and poster contests for youth across the state. Contact your area conservation district for more details and deadlines for your area youth contests. Find contact information for your area district here. Download a sponsorship packet here. The annual poster contest provides kindergarten through 12th-grade students an opportunity to convey their thoughts about soil, water and related natural resource issues through art. It also highlights the educational outreach efforts of conservation districts and their state associations, auxiliaries and agencies. The contest follows the annual Stewardship Week theme of the National Association of Conservation Districts. The 2018 Stewardship Week theme is "Watersheds: Our Water Our Home." Entries must be submitted to your area conservation district. Download 2018 poster contest rules and guidelines here. The annual essay contest is open to students in 6th, 7th and 8th grades. Essays must be between 300-500 words in length and incorporate the annual Stewardship Week theme (see poster contest rules above.) Entries must be submitted to your area conservation district. Speeches must be four to six minutes in length and focus on any current subject that deals with topics such as soil, water, air, rural water, wildlife, forestry, aquaculture, conservation, recreation, recycling, energy, environmental issues, agronomy, etc. Area speech contests will be held during the Area Meetings. For more information, contact your area conservation district. Since 1952, Oklahoma has welcomed high school students from across the United States to the National Land and Range Judging Contest in Oklahoma City. This contest averages 700 participants each year. Contestants must first qualify quality in their home state to be eligible to compete in Oklahoma at the National Land and Range Judging Contest. The contest consists of two separate events – range judging and land judging. 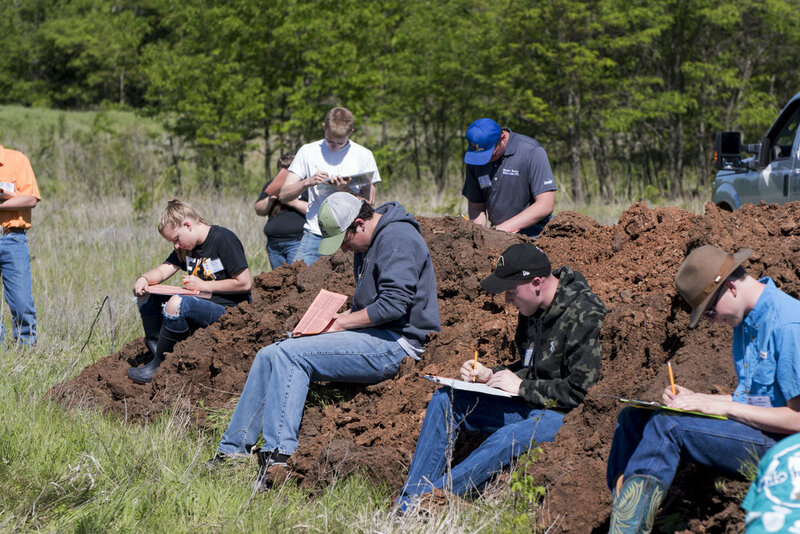 Land judging looks at soil characteristics to determine its quality and capabilities. Examples of areas reviewed are erosion, slope, drainage and permeability. Reviewing these characteristics allows students to learn about how our soil can be used, how different soils should be managed and, most importantly, how to conserve one of our critical natural resources. Range judging teaches students how to properly identify plants, their growth habits and their value for livestock, as well as how to best manage and preserve range land to maximize use and minimize negative impact. The National Land and Range Judging Contest is judged by soil scientist experts from Oklahoma State University (OSU) and the Natural Resources Conservation Services (NRCS). These volunteers dedicate their time to educating participants about soil and plant conservation and provide valuable feedback to the participants. Interested in being a contest sponsor? Contact Sarah Blaney at sarahblaney@okconservation.org.